This section gives an overview of the deployment options for Oracle VM. Oracle VM Manager: The host machine on which Oracle VM Manager is installed is known as the Oracle VM Manager host. It provides the interface where all virtual machine management tasks are performed. Operational commands are sent to the Oracle VM Servers through the Oracle VM Agent. 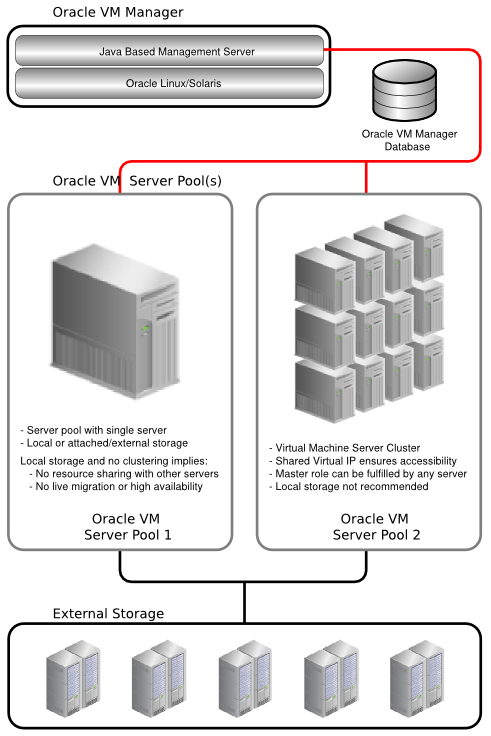 Oracle VM Server(s): An Oracle VM Server must always belong to a server pool, even if it is the only member. The information needed to keep the server pool operational is kept in shared storage and is available to all cluster nodes. Server Pools: A server pool is an autonomous region that contains one or more Oracle VM Servers. A server pool presents a unified view of the storage in which the virtual machines reside. Storage: A shared storage resource is mounted on each Oracle VM Server in a server pool to store virtual machines, external resources, and other data files. In order to perform live migration of virtual machines, each Oracle VM Server involved must have shared access to storage. See Chapter 4, Managing Storage for more information on creating different types of shared storage.